I made these treat cones with the 11 1/2" mini scallop die from Creative Cuts and More, for the big cones cut the die cut in half, for the skinny ones use a quarter of the sheet. Just roll up the paper and secure with killer red tacky tape, tip: the tape will even hold the lace and ribbon on, now that IS good tape! 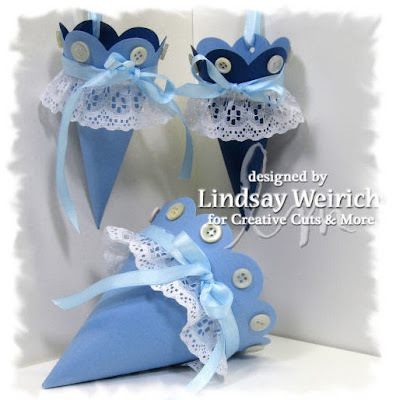 Don't forget you have until August 3rd to upload a baby or bridal shower project to the Caardvarks blog for your chance to win a card kit from Creative Cuts and more! Join in on the Caardvarks Challenge! We have teamed up with Caardvarks for a super fun challenge. Head on over to Caardvarks for all of the details and play along for a chance to win your choice of our one of our new Creative Cuts and More Card Kits. Both the Creative Cuts and More design as well as the Caardvarks design team have created a ton of samples to inspire you. You can see some of these creations here and then you can see even more at the Caardvarks Flickr gallery. 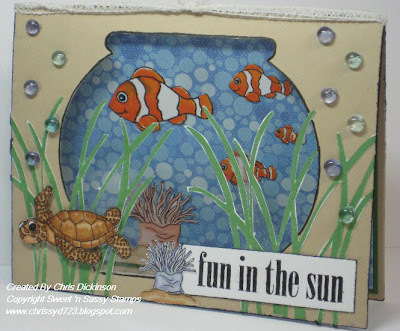 I had so much fun with this fish bowl shaped card from Creative Cuts and More. As soon as I saw it I had this Fishy Scene pop in my head. Listed below are the supplies that I used! 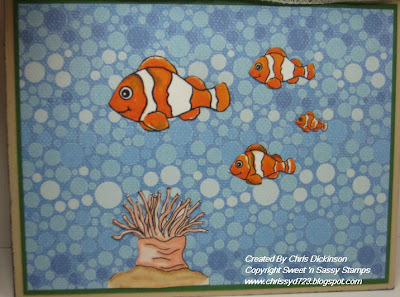 Congratualtions Sandra Stickler, you have won a Creative Cuts and More "Birthday Boy Card!" Please contact us with your mailing address. Thank you so much to all of you who followed us along on the blog hop. 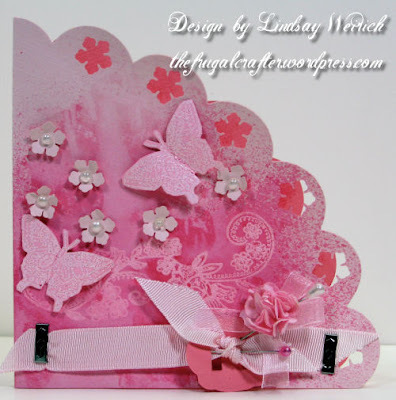 We hope you will all come back often to see all of the fun creations the Creative Cuts and More design team has to share with you here at Die Cut Diva! Welcome to our big mid-summer Blog Hop! We're focusing on birthday cards and projects, and we've got a brand new product line that we're launching today, too! Prepare to be WOWed, everyone! First, let's start with the debut of our adorable Birthday Boy and Birthday Girl Card Kits. These cute kits, designed by Pam Smerker, are packed full of custom die-cut cards plus papers and embellishments to make a dozen cards with plenty of goodies left over to use on other projects. They're a great value! We'll be giving away two of these kits this week (one right here on Diecutdiva.com and the other on one of the blogs on the hop), and you'll get plenty of ideas and samples along the blog hop. Keep reading for details. (A) Leave a comment on this post. (This is limited to one per person unless you meet the criteria of B, C, and/or D below.) Let us know if there are any special themes of card kits or album kits that you'd like to see. Comments will be accepted through 11:59PM Mountain Time on Thursday, July 16th. The winner will be selected randomly via Random.org and posted the following day. Our hop today starts with Chrissy and she'll direct you to the next blog, and they'll direct you to the next blog, and so on. If for some reason a link is broken, don't panic. Just return here to the list and complete your journey. And one last thing before you head off to our hop... we've got a COUPON for you! Save 15% at the Creative Cuts & More Store through July 20th by using the code birthdaydt0915 at checkout. Happy Hopping & Happy Shopping! My daughter needed a cake for a baby shower, so I made this duck cake using the cake box set found here. For the cake stand I used a margarita glass, put the duck in first, added the stones, sealed it up and turned it over. Worked great! The baby block on top spells out the baby's name, Dash. I absolutely love this Color Block die cut. There are so many things you can do with it. You can fill every square with pictures or just random ones like I did. Simply turning it around gives you 4 different looking pages. Maybe use the small 4 boxes on top for a title. A big thank you to everyone who applied for our guest designer positions. We had a great turn out and will be contacting those who have been accepted. There were so many fabulous designers, which made it extremely difficult to decide. We appreciate all of you for the taking the time to send us your fabulous work. Shaped paper with a twist! I'm gonna let you in on a little secret, My favorite die cut at Creative Cuts and More is the 11 1/2 mini scallop circle. I know there are fancier boxes and cards on the website but I like this one best! Why you ask? Because there is nothing better for braking you out of a scrapbooking slump than changing the shape of the page. But this die cut isn't just for scrapbooking. Check out the two cards I made with half a sheet of the shaped paper. An that isn't the end of it either. I have several other projects to share with you this month using this die, when I'm done you're gonna want one in every color...come to think of it so do I!